A symbol of pure novelty, the intriguing appearance of the new Visconti Watermark Fountain Pen has mesmerized pen aficionados from the day of its inception. This unique writer has received a lot of acclamation for its finesse design and the performance it gives on paper. At first look, the pen is gorgeous and carries the proud legacy of Visconti's innovation, craftsmanship, and elegance. Crafted with precision, this surreal writer combines two sophisticated elements to create a vivid charm that will even surpass expectation. The acrylic cap and barrel of the pen are wrapped inside filigree cut out from a solid silver tube. The filigree cut off resembles with Visconti's logo and artisans at Visconti have carefully aligned brand's symbolic representation to create a watermark type pattern, doing justice to the name. While writing, the transparent profile of the pen allows you to check the volume of ink. The sterling silver exterior of the pen is coated with a layer of palladium to prevent it from tarnishing. 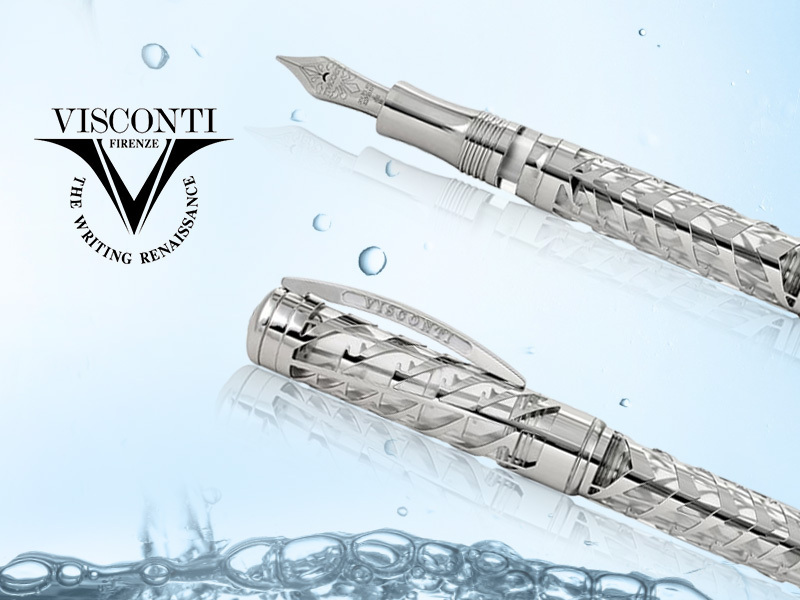 The precise construction makes the new Visconti Watermark a masterpiece and demonstrates the out-worldly ideas of Visconti artisans. As majestic as the pen looks on the outside, its functional side is equally elegant as well. Each Visconti Watermark Fountain Pen is equipped with a double power reservoir which holds large volume of ink compared to standard fountain pens. Like other luxurious pens from Visconti, this fine writer is also fitted with a 23kt Palladium dream touch nib. The nib comes in six different options: fine, extra fine, broad, double broad, medium and stub. Between the nib and the barrel, there is decent space that allows a comfortable hold while writing. Though the profile of the pen looks sharp and edgy, it is a beauty to hold. The large profile of the pen sits perfectly in your hands, while its ergonomic grip section offers an effortless penmanship experience. The cap of the Visconti Watermark pen is fitted with a traditional Visconti bridge shaped clip with the name of the brand chiseled on either side. On the top of the cap, there is an embedded logo of Visconti, while the rear has a neatly done flattened end. The stupendous design of the pen is further garnished by a beautiful band that reads Watermark. And, for pen aficionado's who don't prefer writing with a fountain pen the series is also available in rollerball version. At Pen Boutique, we are selling Visconti Watermark Fountain Pens for $1695 and the rollerball version for $1495. All said and done, the Visconti Watermark will make a great collectible in every pen enthusiast's pen chest. Like every other pen from Visconti, this fascinating writer has also helped to reposition the value of pens from writing utensils to luxury accessories. The value of this pen is nothing less than that of a precious ornament; the precision of this unique writer makes it a precious gift for special occasions and an item which could be passed to future generations. For best deals, subscribe to our newsletter and we'll frequently update your inbox with our latest arrivals. There is something about Paulo Coelho's "The Alchemist" that makes me want to read the novel again and again. The book has become a source of inspiration for many. Every strong word mentioned in the novel lets us see the world with optimism and tell us everything is possible until we really want it to happen. The purpose of the new Montegrappa Alchemist edition is somewhat the same!!! The pen is designed with a keen appreciation for the artist's thoughts and is inherited with vivid symbols and meanings illustrated in the renowned novel. In short, we can say Montegrappa Alchemist series is a beautiful interpretation of Paulo Coelho's famous novel 'The Alchemist'. Montegrappa Artisans have carefully embedded the motifs of the story on the pen to create a lucrative appearance, while keeping the functional side on their mind. Like all other pens from Montegrappa, this fine series also carries the legacy of the brand and reflects a finesse design marked with perfection. Made of special metals and embedded with precious gemstone, this fine pen exhibits the creativity of Montegrappa artisans. Like the name suggests, Montegrappa have converted their master craftsmanship and fine elements into a graceful product which even surpasses expectation, and named it - "Montegrappa Alchemist Series". The series is available in two different writing modes (fountain pen and ballpoint pen) and four different designs - air, water, fire and earth. At Pen Boutique, we are selling the sterling silver edition which is limited to 1000 pieces. Each enamel coated sterling silver pen represents one of the four elements. Only 125 fountain pens and 125 rollerball pens are made in each color. The evocative design of each Montegrappa Alchemist series makes it a wonderful collectible for pen aficionados, while inspiring others to follow their dreams. Montegrappa Alchemist Sterling Silver writing instruments sit at the epitome of novelty and perfection!!! These fine writing instruments are conceived in the purest form and are coated with several layers of enamel to preserve their timeless elegance. These fine writers are handcrafted in the historic town of Bassano Del Grappa, Italy. Each writing instrument is finely inspected until they acquire the highest level of precision. The pen features a hefty and evenly balanced profile designed to offer a robust grip while writing. Its ergonomic grip section sits perfectly between your fingertips, while allowing you to rejoice every bit of your writing. As splendid as the pen looks on the outside, the functional side of this fine writer is also synonymous to its appearance. Montegrappa Alchemist Sterling Silver fountain pens are fitted with a sturdy 18kt gold nib with an etched designed of a peacock fanning its tail. Gliding over the paper, the nib is flawless and doesn’t scratch nor has inconsistent ink flow. The nib is a pleasure to work with and sums up a joyous experience. The body of the pen is embellished with small details to project Paulo Coelho's words inscribed in the famous novel - 'The Alchemist'. The overall appearance of the pen illuminates Coelho's message, and its finesse design inspires the users to follow their dreams. Each pen comes in a beautiful wooden case which prevents the pen from receiving any external casualties. 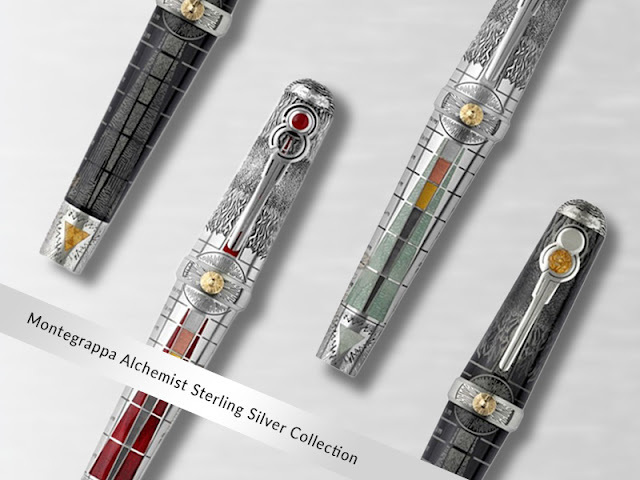 The stupendous design of the Montegrappa Alchemist Sterling Silver Collection definitely lives up to its name. The eye-catching appearance and minute detailing makes it a perfect writing instrument for both pen enthusiasts and collectors. The only downside of this series is its limited quantity. Then again, if this writing instrument were available in abundance, it wouldn't be so precious.